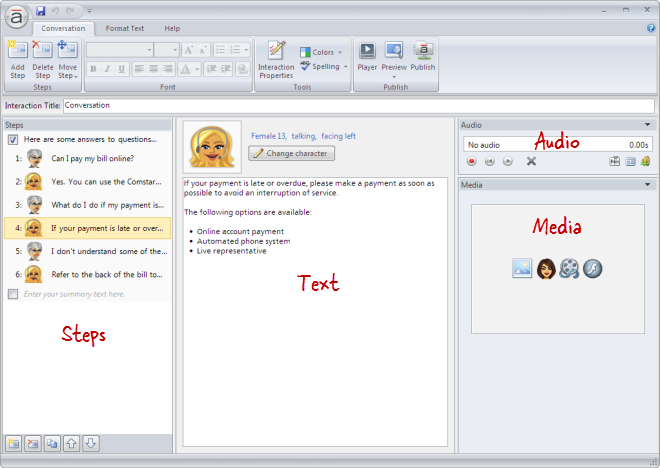 Steps: Located on the left side of the screen, this panel is used to manage steps for the Conversation. Text: Located in the middle of the screen, this panel is used to switch characters and add text to each step. 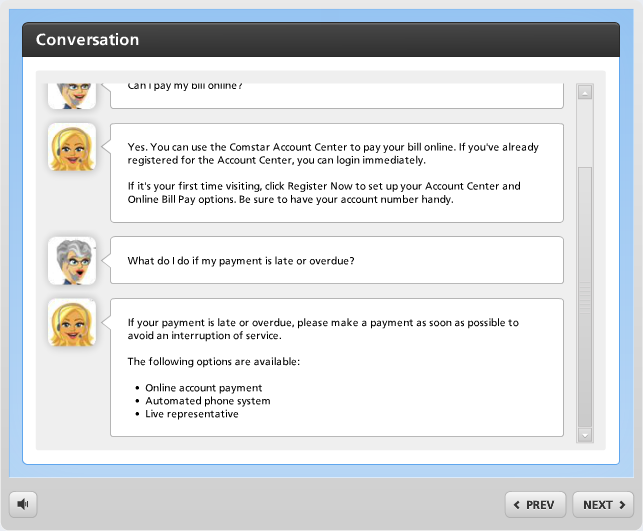 Go to the Conversation tab on the ribbon, and click Add Step. 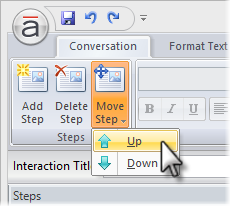 Tip: A Conversation interaction can have an unlimited number of steps. 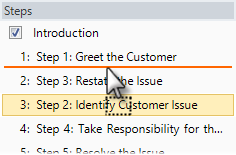 To change the character that's speaking, select a step in the Steps panel. Then click the Change character button at the top of the text panel, and choose one of the following options. Characters in use: Characters that have already been added to the interaction will appear at the top of the list. If you want to reuse one of them, simply click its avatar. Picture from file: Select this option if you want to choose an image from your computer. Browse to the image, and click Open. 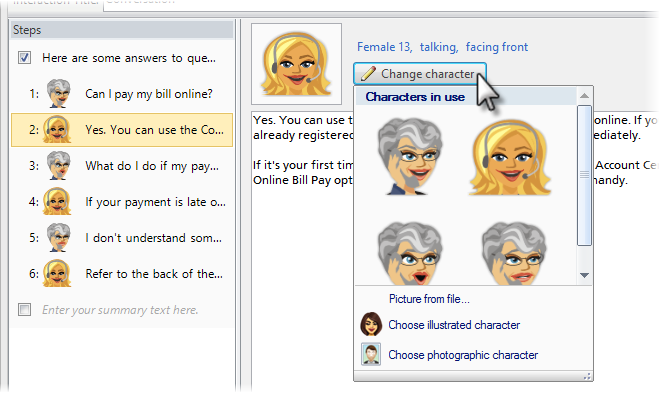 Choose illustrated character: Select this option to use one of the illustrated characters that comes bundled with Articulate Engage. When the Characters window opens, choose a character, expression, pose, and perspective. As you make selections, the character preview pane on the right side of the window will update to reflect your choices. When you're finished, click Insert. 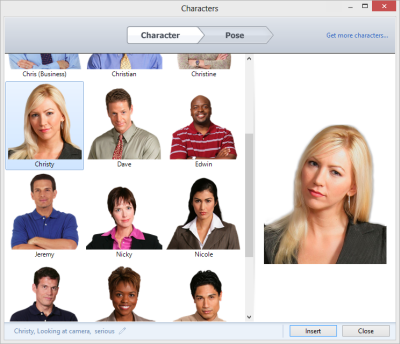 Choose photographic character: Select this option to use a photographic character. (Engage comes with one photographic character, but you can purchase additional characters in the Articulate Store.) When the Characters window opens, choose a character and pose. As you make selections, the character preview pane on the right side of the window will update to reflect your choices. When you're finished, click Insert. Note: Characters will always display on the left side of the conversation. 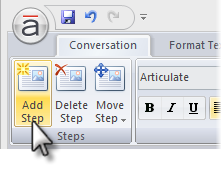 Go to the Conversation tab on the ribbon, click Move Step, and select either Up or Down. 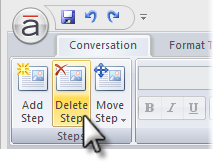 Go to the Conversation tab on the ribbon, and click Delete Step.